Diario Médico reports on the latest article by the Barcelona Macula Foundation published by the prestigious science journal Clinical Ophthalmology. 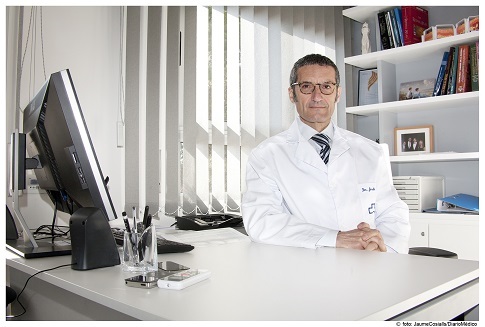 The study, signed by the Director of the BMF, Dr. Monés, and researchers Dr. Badal and Marc Biarnés, proposes an innovative approach to the treatment of retinal angiomatous proliferation. This pathology, a subtype of age-related macular degeneration (AMD), causes serious damage with a high risk of tearing of the retinal pigment epithelium while treating the disease. In the cases where epithelial tearing occurs, the loss of visual acuity is irreversible in the patient. In its article, Spain’s benchmark medical journal highlights the degree of innovation contained in the theories of the Institut’s working group. By analysing the case of a 71-year-old patient who displayed major secondary pigment epithelial detachment, the researchers proposed a fortnightly treatment with the administration of 0.25 mg de ranibizumab, half the customary amount. The novelty lies in the frequency of the treatment being fortnightly rather than monthly, thereby maintaining the total dosage and reducing the risk of tearing of the pigment epithelium and avoiding irreversible loss of visual acuity in the patient.